Fraîchement rénové et intérieur de bon goût, votre séjour à l'intérieur sera aussi agréable que votre temps sur la plage. Tous les 4 chambres en bord de mer ont vue sur l'océan, mur à écran plat 37 ou 39 pouces montés téléviseurs avec Blue Ray / DVD / CD capacité / Smart TV et de lits confortables. Salon dispose nouveau téléviseur à écran plat 60 pouces avec son bar et sub-woofer pour les grandes soirées de cinéma. Au dernier étage, vous trouverez la chambre principale avec un lit king-size, salle de séjour confortable, salle à manger et une cuisine entièrement équipée tout avec une vue imprenable. En bas se trouvent trois autres chambres: 2 avec lits queen-size et la troisième avec un grand nouveau jumeau sur un lit superposé complet avec deux lits gigogne gigogne pour dormir tous les enfants. La maison dispose de deux niveaux de terrasses en bord de mer, deux balançoires, meubles de jardin et une vue à 180 degrés sans précédent. Captain Andy’s house is a perfect get away. We spent a week here and enjoyed every minute. The house is well equipped with a well stocked kitchen. The deck is amazing with plenty of room and built in gates. The location is great, with miles of beach that during our stay was essentially all to us. Access to cable and movies. Already thinking about next year! The best beach house we ever stayed in!!! Simply put, Captain Andy "nailed it" !!!! Too many superlatives to list!! Our entire family agree this house was the best hpuse we ever stayed in. Rest assured you will have not one regret booking and staying at Captain Andy's..We will def be returning. Thank you Andy! 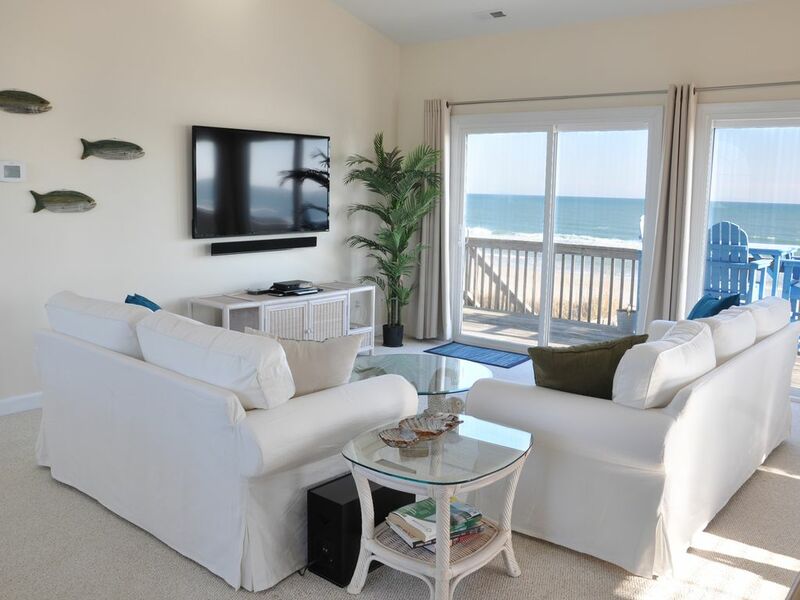 Captain Andy's is a clean, comfortable home away from home with a spectacular ocean view. This was our second time staying here with our family and it won't be our last. We've stayed at other beach houses on Topsail but Captain Andy's tops them all! Thank you, Captain Andy, for a lovely time! Thank you Sarah! Please come again soon and book early! Property is very well maintained. Captain Andy’s is a wonderful beach house! The provided chairs, umbrellas, and beach toys make packing a lot easier. The kitchen is also very well equipped. The house is very clean and uncluttered. We were able to quickly move in and get settled. We thoroughly enjoyed our stay. We enjoyed our stay at Captain Andy's. It is well-maintained, thoughtfully furnished and clean (which is very important to us). The furniture and beds are very comfortable . . . perfect for a relaxing vacation. The bedrooms are beach front, but due to the humidity and salt air, the windows/doors shouldn't be left open. So, we were disappointed we couldn't go to sleep and awake to the sound of the ocean waves but completely understand and respect the reasoning. Our senior dog had a problem going up the steps (inside (not carpeted) and outside), but I suspect most dogs wouldn't. The neighboring houses are close, but we never heard noise from them. There are cute shops and good restaurants as well as a convenience store within walking distance. The beach is long and very wide at low tide . . .perfect for long walks. Captain Andy is very easy to work with and quickly responds to any questions. Thanks for the review Steve. I'm sorry your dog had trouble with the stairs. I'd love a house with an elevator but I haven't found the perfect one yet. I'm glad you had a great week at the beach. Calme Ocean Blvd. emplacement. Escapade en famille parfaite. Rate does not include the 6.75% NC state sales tax, 6% local accommodations tax and mandatory cleaning fee. Call with any questions.